Veins can sometimes be used to replace arteries that are diseased. The process of removing them is called harvesting. Leg veins are frequently used for vein harvesting. For open chest procedures, like coronary artery bypass grafting (CABG), veins or other blood vessels in the chest are often used. Diseased arteries with atherosclerosis have a buildup of plaque that can block the flow of blood. 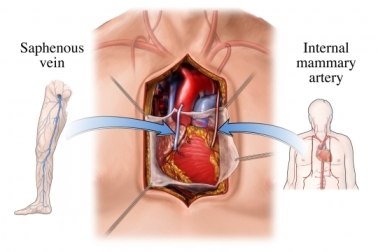 Coronary (heart) or carotid arteries to the brain are often repaired by making a bypass. Vein grafts are most often used to bypass these blocked arteries. The preparation you will need will be determined by the primary procedure. In most cases, it will be a major cardiac or vascular surgery for which you will be hospitalized and evaluated thoroughly. You will not be able to eat or drink for 8 hours prior to the procedure. You will be given general anesthesia . It will keep you asleep during the procedure. A long cut in the skin will be made to expose the entire length of the vein. Every branch of the vein will be found and tied off. The vein will be removed. The skin will be closed with stitches or staples. Two small incisions are made at either end of the vein. A special long, thin tool with a camera on the end (endoscope) is passed through one of the incisions and along the vein. The tool will separate the vein from its branches and surrounding tissue. The vein will then be removed through the second incision at the other end of the vein. The primary surgery will take place. Your leg (or legs) will be wrapped tightly to prevent bleeding from the remaining veins. Vein harvesting is usually done at the same time as the primary procedure. It does not add time to the total surgery. Your hospital stay will depend on your primary procedure. Vein excision will not extend your stay. Bitondo JM, Daggett WM, Torchiana DF, et al. Endoscopic versus open saphenous vein harvest: a comparison of postoperative wound complications. Ann Thorac Surg. 2002;73(2):523-528. Endoscopic vein harvesting. Mid-Atlantic Surgical Associates website. Available at: http://www.heartsurgeons.com/procedures2.html#pr2d. Accessed November 30, 2017. 6/2/2011 DynaMed Plus Systematic Literature Surveillance http://www.dynamed.com/topics/dmp~AN~T905141/Treatment-for-tobacco-use : Mills E, Eyawo O, Lockhart I, Kelly S, Wu P, Ebbert JO. Smoking cessation reduces postoperative complications: a systematic review and meta-analysis. Am J Med. 2011;124(2):144-154.